It is that time of year when we start battening down the hatches and prepare to spend a lot of time indoors. Before you head inside for the winter season, it’s important to make sure that everything outdoors is ready to go – including your roof. Roofs can take quite a beating during the winter between the strong winds, heavy snows and ice forming on top. Make sure your roof is ready to go this winter with these few tips. Chances are you don’t go up on your roof regularly to inspect it. Make it a point to grab the ladder and go up top to look for any damage. Broken shingles, cracks or visible weak spots are problems best spotted – and repaired – before they result in water damage or structural failures. Make sure your gutters are flowing properly to drain runoff water through them. 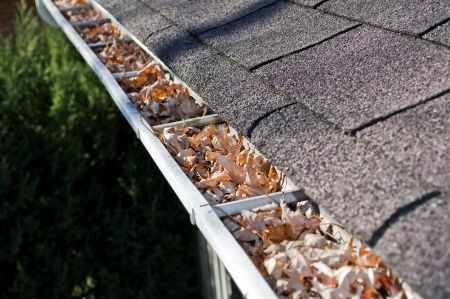 Remove debris that could have piled up from the fall with leaves clogging them up. You should also check the way your gutters are draining; they should drain away from your home so that the water leaves the area, rather than building up near your foundation. Water draining near the home can re-enter your house through the basement, potentially leading to another costly repair if this damages your foundation, spoils your furnished basement, or allows mold to form in your home. Don’t forget to check for signs of water damage or cracking on the inside of your home, too. If you see new cracks appearing in your attic or along ceilings on the top floor, it could be from vulnerabilities in the roof. Water stains can also be a symptom of leaks in your roof, and should be investigated thoroughly to make sure that these problems are found and fixed before they lead to rot, further damage to your ceilings or degradation of your home’s insulation. Make sure to get out and inspect your home from top to bottom to make sure that you’re ready for the winter. By taking the time to run through the tips we suggested above, you can take care of any potential issues now, instead of in the middle of winter after your small repair turns into a massive issue. If you find problems or just would like a professional opinion of your roof before the flakes fly, contact Roofing by Bruce today!